Sharp clear printing; each decal in perfect register; carrier film that is thin and kept to a minimum. A great range of products for the Luftwaffe enthusiast to scratch-build or enhance their instrument panels. Let's face it. One of the first things that you look at when you examine a model is the cockpit. Your eye is drawn towards the seat to see if it the modeller has gone to the trouble of adding seat belts and the other thing you look at is the instrument panel to see how realistic the modeller has made it. With instrument panels, you can get away with a simple paint and dry brush of the panel in 1/72nd scale and to a certain extent with 1/48th scale but you need to provide some form of simulation of the calibration markings within the gauge faces as well as some form of ‘glazing’ in the latter scale. 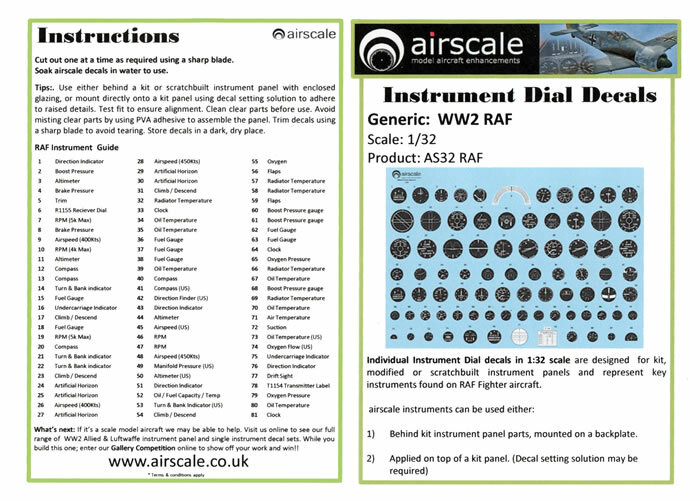 When you get to 1/32nd scale as well as 1/24th scale you definitely need both calibration markings as well as glazing, more so with 1/24th scale where you just about need to see numerals! An alternative to painting them is to use the decals that some manufacturers provide in their kits but that is only a partial solution as you still need make the supplied decal conform to the raised detail on the plastic instrument panel and settle into the holes meant to represent the gauge faces as well as ‘glazing’ the faces of the gauge. Given that there are more and more 1/32nd and even 1/24th scale kits hitting the market now you need to hone up on your painting skills to do the instrument panels of these kits justice. Or do you? Airscale Model Aircraft enhancements from the UK have come to the rescue with and neat and effective solution by providing you with two alternative methods to solve the problem. Airscale have adopted the “sandwich” method as their solution, nothing new with the sandwich method as it has been used by modellers who dabble in the larger scales for many years now. 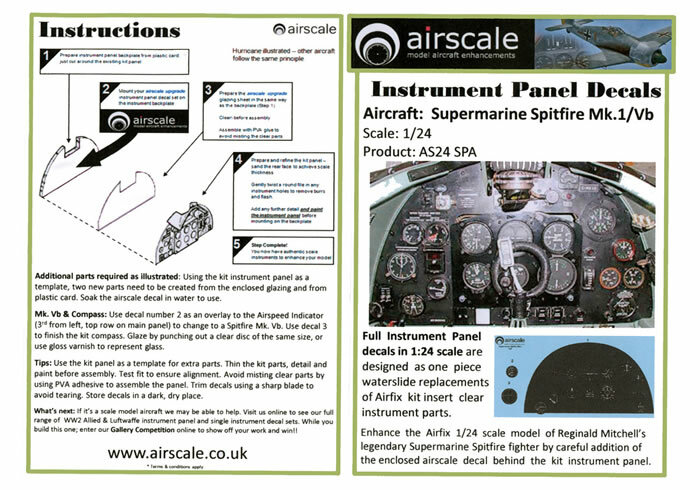 However, what Airscale have done is to provide you with very high quality decals as well as high quality very thin and very clear vinyl to sandwich between a scratch built backing sheet and the kit supplied instrument panel. 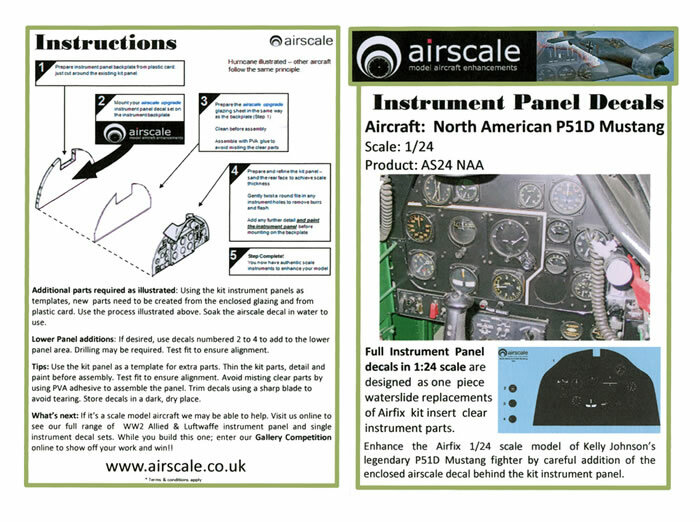 The instruction sheet that accompanies each Airscale set provides you with details of how to go about achieving the end product of an effective scale reproduction of an instrument panel in five steps. “Prepare an instrument panel backplate from plastic card: just cut around the existing kit part.” An easier method is to place the kit instrument panel on the plastic card and draw around it with a sharp pencil and then cut it out of the sheet. “Mount your Airscale instrument panel decal set on the instrument backplate.” A tip for you here is to paint the backing plate gloss black as decals adhere better to a painted surface than bare plastic. Prepare and refine the kit panel – sand the rear faces to achieve scale thickness. Gently twist a round file in any instrument holes to remove burrs and flash. Add any further detail and paint the instrument panel before mounting on the backplate.” Read here that you need to remove the plastic from the instrument panel so that you have holes where the instruments appear. AS24 HUR - Hawker Hurricane Mk I (for the Airfix kit.). 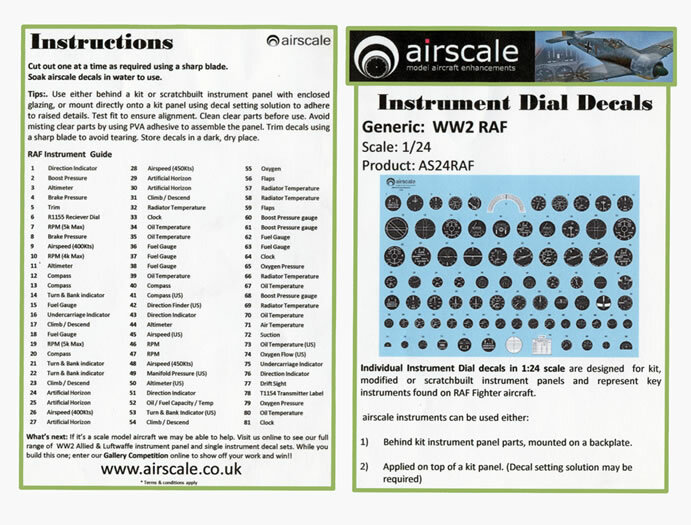 Airscale also offer sheets of individual “generic” dial decals. These are designed to be used either in the sandwich method or applied on top of the kit’s instrument panel. The decals have been printed by the Fantasy Printshop and very sharp and clear with the numbers on some of the gauge faces legible (under strong magnification!). 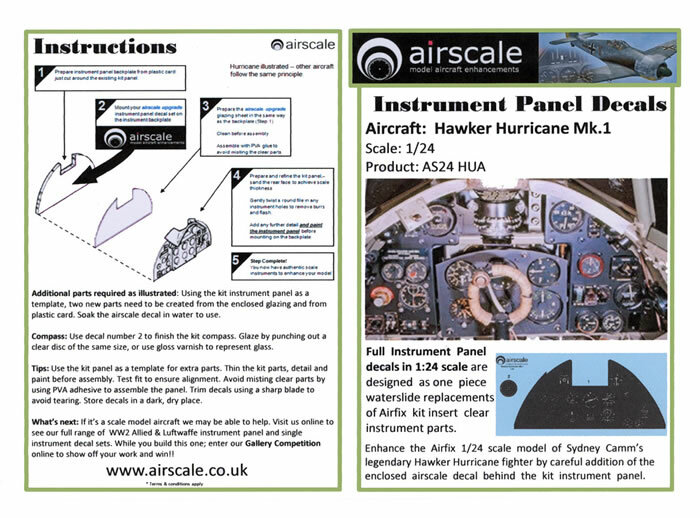 Each set comes with a small sheet that carries full instructions sheet on how to create your instrument panel as well as a full colour image of the panel that the set is designed for. The generic sheets also have a small instruction sheet to guide you on the two alternative processes as well as a chart that identifies each individual instrument on the decal sheet. The decal itself as well as the stock of clear vinyl comes sandwiched between small pieces of grease proof paper. Packaging is via a small clear plastic zip-loc bag. So there you have it, a simple, effective way of producing high quality instrument panels courtesy of Airscale Model Aircraft Enhancements. Whilst no sets are currently available in 1/48 scale Airscale advises that their production is under consideration.